Mexico–US border is a wall between two states. It's very bad. Peace lines / Peace walls - fencing lines separating Catholic (usually Irish) and Protestant (British) areas in Northern Ireland, the first of which were built during the height of the Conflict in Northern Ireland (some of which was built already in 2008) to minimize the contact of these two groups. Cryptocolonial administrations use the same methods as their metropolises. Вдогонку к постингу про Великую европейскую стену (великую - потому что возведенную по всему сухопутному периметру Африканской Европы). В комментах к тому постингу мне вспомнилась другая европейская стена. Не такая великая, конечно, но несколько более длинная и уж заведомо более сюрная. Это даже не стена, а комплекс стен. И разделяют эти стены не соседние страны, а соседние городские районы одной и той же западно-европейской страны. Называются эти стены очень утешительным, возвышающим и вдохновляющим именем - "Стены мира", Peace Lines. @Kathie, i agree with you. Fencing yourself with walls is normal for a civilized humans. I wonder why suddenly so many Democrats are attracting such attention to this topic. Like are they not civilized, behave like not empowered heathens. 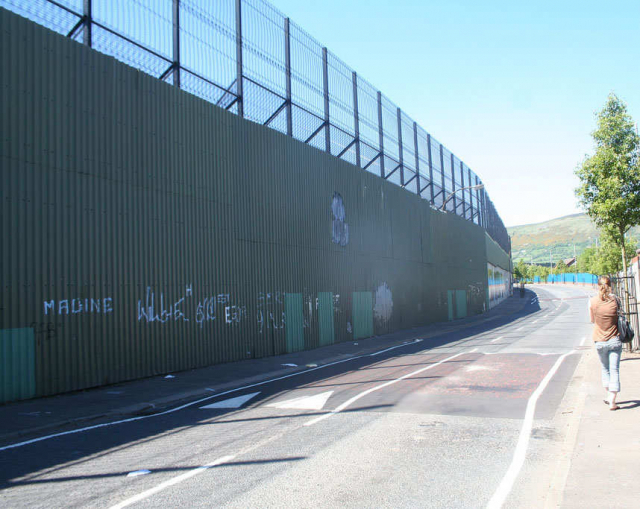 For example, the Labor Party in the UK (an analogue of Democarts in the metropole) does not attract so much attention to the walls in the cities of Northern Ireland. This indicates their high culture and gentle. A self-respecting gentleman understands the inevitability of enclosure from savages. I'm not sure I agree with the inevitability of enclosure from savages. By the way, i also do not agree. But i understand that in the civilized world - this is the norm. After all, i was born in a culture fenced with similar walls and trade embargoes with the Western world about 70 years. As far as i understand the current English culture, savages are those who have not undergone empowerment, categorically do not accept this, but at the same time try strive to live alongside with civilized multicultural people of the knowledge society on one land. One of the most prominent examples of the modern savage is homophobic-traditionalist. Fences are necessary, no matter their purpose. I would even clarify, not fences but divisions (fences just a form of divisions). Division, separation is the basis of a humanistic civilization. But to call one motive "good" or another "bad" is completely subjective. Yes, so i don’t understand why the majority of Democrats in the fediverse of recent months have been actively promoting the position "Trump's Fence Is Very Bad". After all, the fence in Northern Ireland is not so bad, civilized European Walls in Africa too...but no one attracts attention to it. Is it really only in semantics? And if Trump calls his fence for example the Fence of Peace, will everyone calm down at once and stop drawing attention to it? @Kathie I think it is possible to revise this concept, i do not think it is optimal. The building of the fence is associated with proprietation: the desire to part of the system to become closed. Closed systems are not viable in natural environment. Therefore, there is always a gate (door). And sometimes some back-doors. If a special pass mode is working, a catapult or Trojan horse will appear. This is the natural order of things - there is always someone who is interested, and what is there - behind this fence.